A former chef at a Snowdonia hotel has been given a suspended prison sentence for killing a feral cat which had wandered into a hotel kitchen. Dylan Marcus Edwards, 50, from Llanrwst in Conwy county, admitted causing suffering to Cali the cat which was put in a bag and hit with a piece of wood. 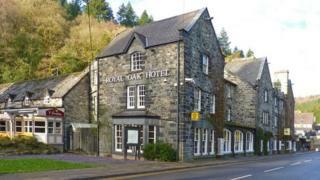 Llandudno Magistrates' Court heard the cat defecated in the Royal Oak Hotel kitchen in Betws-y-Coed in December. Edwards was sentenced to 18 weeks in prison, suspended for two years. Tudur Owen, prosecuting for the RSPCA, said the cat had also bitten and scratched other members of staff. Colleagues had penned the cat under a fridge using chopping boards. Edwards and a colleague entered the kitchen saying "we're going to have to kill the cat" and came out with the animal inside a black bag, carrying a piece of wood and saying "we'll have to put it out of its misery". The court heard the pair were challenged by another colleague but Edwards was concerned the cat would return if they chased it away and said to her: "We don't have a choice." There had been a furious local backlash following the cat's death and an online petition calling for those responsible to be prosecuted attracted more than 35,700 supporters. Melissa Griffiths, defending, said Edwards had been dismissed from his job after 32 years working at the hotel. "He's been vilified since and has become a hermit in his own home, afraid to go out because of the strength of feeling against him," said Ms Griffiths. "He's been verbally abused and refused service in his local village. He wrongly believed the cat was not a protected animal because it was feral." Edwards was ordered to carry out 250 hours of unpaid work and pay £865 costs. The court also heard the case against another 36-year-old man had been dropped. Speaking after the case, RSPCA inspector Phil Lewis said: "The cat was put in a black bag and hit with a piece of wood. To me it's a heinous act. This was premeditated, pre-planned."